This is a 5-night, 6-day workshop. Your adventure begins at 10 a.m. on April 21 and ends after a final slideshow on the afternoon of April 26. As with all National Parks at Night Passport Series workshops, we will teach at this location only once. If you have a dream of making epic long exposures at night at Great Smoky Mountains National Park, we hope you join us. This is a 1-night workshop add-on. Your adventure begins at 7 p.m. on April 26 and ends when we are done shooting that evening. See below for full description and requirements. $400 + applicable taxes. Apply below. After registering for the main workshop, you will receive a link to optionally register for this post-workshop hike. First come, first-served. Balance of $1,250 due on January 21, 2019. Last day for a cancellation request is January 20 (see cancellation and refund policy). This workshop begins during the waning gibbous moon, and will appeal to photographers interested in using gentle moonlight to bring out landscape details with some light painting closer to the camera. 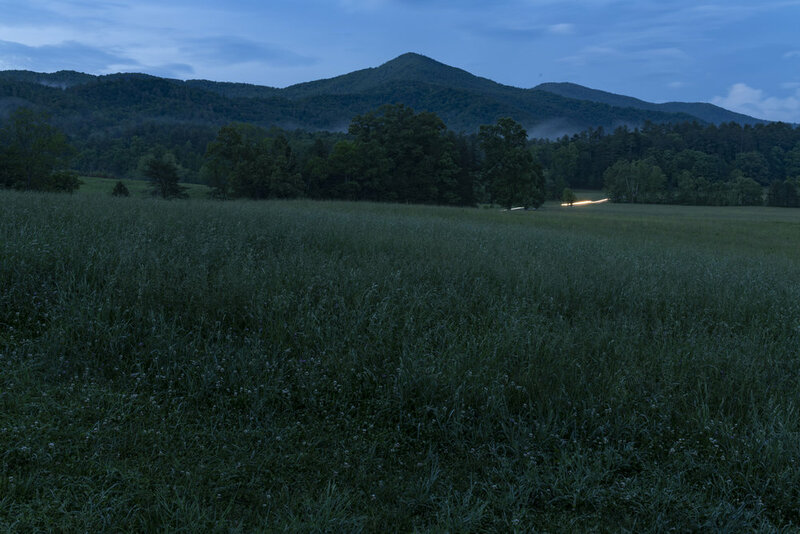 The workshop will explore the gentle mysteries of Cades Cove, the drama of Clingman’s Dome (the third tallest mountain east of the Mississippi River), and rushing rivers and waterfalls winding between the mountains and the high mountain passes. Great Smoky Mountains is a wild forest park nestled between urban areas in Tennessee and North Carolina. It doesn’t have the darkest skies in America, but it does have panoramic views of mist-shrouded peaks, deep valleys and old-growth forests, and is steeped in history of settlements frozen in time. This includes many original churches, schoolhouses and more that are preserved and maintained by the National Park Service on this precious federal land. 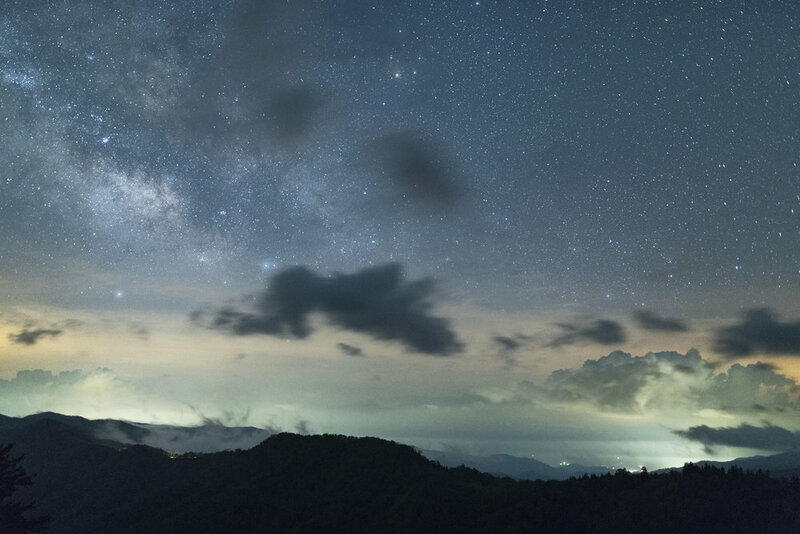 All of these elements combine to make Great Smoky Mountains National Park the most-visited park in the U.S. It’s truly a magical alchemy of nature for night photography. 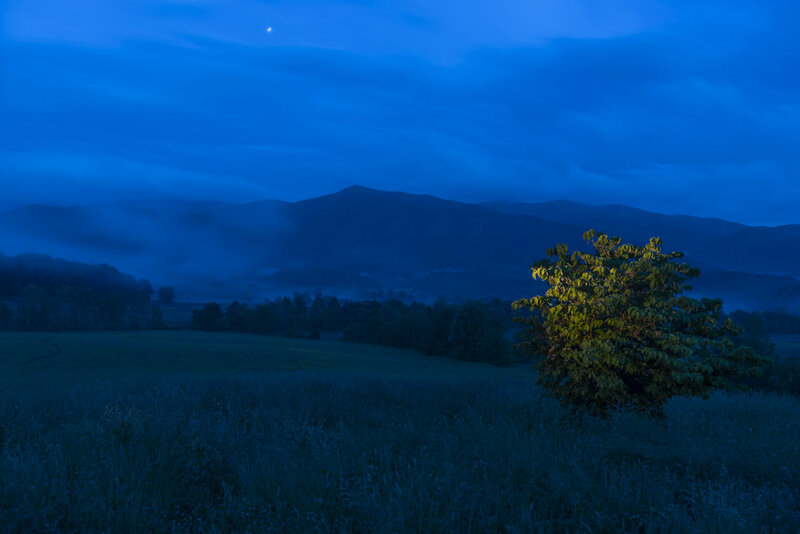 For those who just can’t get enough of Cades Cove! Our visit to this highly photographic area during the main workshop will have more moon, and bikes will be available to rent. This add-on is a peaceful walking tour in and out during a darker-sky night. We won’t do the entire 11-mile loop, but we will walk a good portion of it, as well as potentially meandering along Hyatt Lane and Sparks Lane, gravel roads that trisect the loop. We will stroll inward during sunset and enjoy the darkness of the last quarter moon for the darkest skies. We’ll light paint the fields, tress, wooden fences, quiet country lanes and historic structures, and will create more star stacks with some Milky Way. You’ll go home after the workshop with a solid grasp of night photography in a moonlit environment, and a good foundation in light painting techniques. Our locations have generous room to explore, so everyone will be able to spread out and not get in one another’s way. Each participant will have the opportunity to work one-on-one with Matt and Lance in the field. The workshop will be based out of Townsend, Tennessee. You are not required to stay at the official workshop hotel, though doing so does make it easier to meet with the group each morning. Booking info and a group code will be sent after registering. It’s spring in Tennessee. Mid-April weather is usually milder and more predictable than the weather earlier in the spring. Daytime temperatures often reach the 70s and occasionally the 80s. Below-freezing temperatures at night are uncommon in the lower elevations but still occur higher up. April averages over 4 inches of rain, usually in the form of afternoon showers. The average high is 87 F and average low is 58 F, so plan accordingly for varying conditions and check the weather while packing for your trip. Recommended attire: We’ll be spending much of the daytime at the hotel with some late afternoons in the park, so we should mostly avoid the midday rains. Wearing long pants is advisable, but shorts and a T-shirt are great too—especially if you bring some light layers to add as the evening draws on and when we go up to higher altitudes. We suggest bringing a rain parka and even rain pants just in case a storm system blows through. Waterproof trail shoes are advisable, as the grass can get dewy at night. No truly vigorous activity will be required, but please consider your physical abilities prior to registering. There will not be any long hikes, but you should be comfortable carrying your own equipment over uneven ground in the dark. We will be hiking up a paved road to Clingman’s Dome —which is challenging with gear but easy to do with breaks on the way up. You will be thirsty. Please stay properly hydrated. We suggest drinking at least a gallon of water each day. Start at home a week or two before the trip to get your body accustomed to retaining that amount of hydration. The Smokies are at times enigmatic and at times warm and welcoming. They are certainly mercurial, earning the “mountain weather” moniker through and through. Trusting none of the “weather guesses” (as one NPS volunteer described it), I ventured out into the park, day after day and night after night. I drove through rain to emerge into brilliant sunshine, and the opposite. I stood atop Clingman’s Dome and within a half-hour went through what felt like four seasons. From a complete whiteout of fog and clouds to brilliant, dappled sun with puffy cumulus clouds. It was breathtaking. The changes are swift, and unpredictable. I really love a mystery. And I do love believing that anything can happen. It was in this spirit that I set out every night, expecting nothing and being surprised nonetheless. The numerous gurgling rivers that swiftly run through the valleys are capped by an old-growth tree canopy. At high noon, the sun dapples on the rapids and quiet pools. And the roads hug these waterways, complimenting every excursion. Cades Cove, a somewhat flat, somewhat rolling valley between two forested mountain ridges, is a wonderland of wildlife and natural beauty. I could idle away my days there for weeks. I felt quite safe, even within eyesight of black bears and coyotes. It’s placid, beautiful and feels like a place set aside from time itself. The mountain passes, switchbacks and peaks are all subject to the whims of the weather. At their most beautiful, they live up to the namesake of the park, smoky, ever-changing and partially revealed. Those shy peaks pass in and out of eyesight like ancient watchers, solemnly gazing back at the observer. They invite exploration, and ask you to look for their secrets. A few evenings among the highest peaks will leave you asking why you’d ever leave. I ask myself the same question, writing this in the airport moving further away from a place that has captured my heart.